Paris in Town, Le Bistro, Le Cafe, Restaurant, French Bakery, The Gardens, North Palm Beach, Palm Beach County, Florida, “A Taste of France in the Palm Beaches”, Love French Macaroons! Arriving in Singer Island, Florida for a little Spring Get-A-Way found us looking at grey skies. 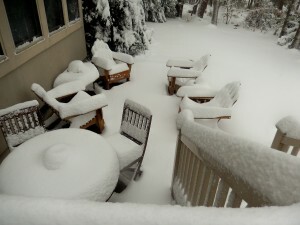 That was not going to deter Cindi, Madelon and I. We were determined to enjoy our stay to the fullest. 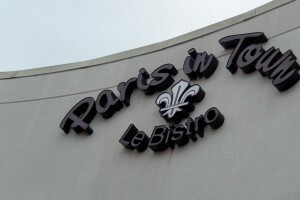 Our first stop just as soon as our luggage was dropped off (mine was lost to be delivered later in the evening) was to have a late lunch at Paris in Town, Le Bistro located at the Gardens on 11701 Lake Victoria Gardens Ave., North Palm Beach, FL 33410 Tel. 561-622-1616. Website? 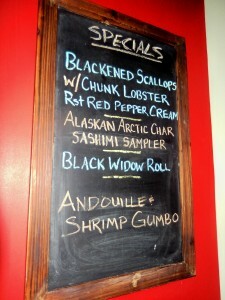 http://www.parisintownbistro.com. 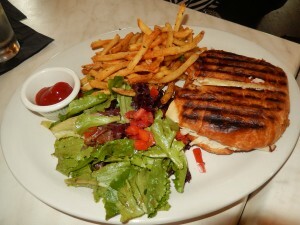 This restaurant is casual and was opened after their first restaurant, Paris in Town Le Cafe opened years ago and became an institution in North Palm Beach. 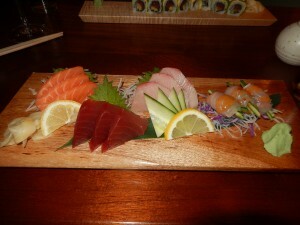 They serve lunch, dinner and Sunday Brunch. 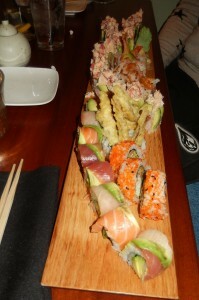 We arrived late in the afternoon and even though we waited a bit to be served, our lunch was very good. 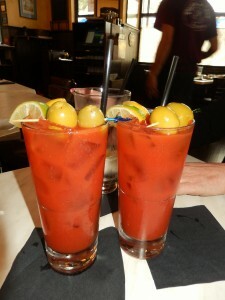 We were all thirsty after our trip so Bloody Marys were a good way to start. The Smoked Turkey with Apple and Brie hit the spot. 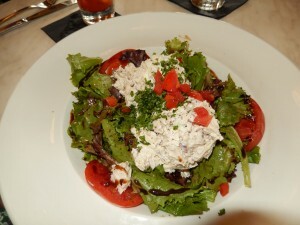 The King Henry Chicken Salad was fresh and delicious. 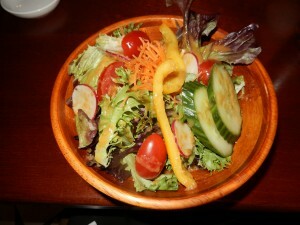 My Nicoise Grilled Tuna Salad….sorry I must have been I don’t know where but I forgot to take the photo. 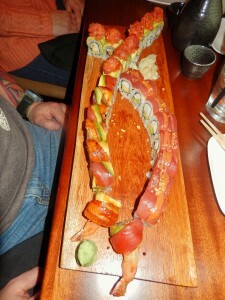 The tuna was fresh and was cooked medium rare….just to my liking. 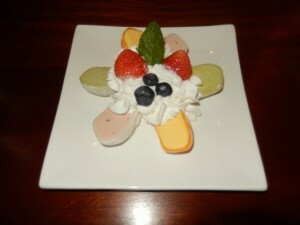 Paris in Town Le Cafe is located at 11460 U.S. Highway 1, at PGA Blvd., North Palm Beach, FL 33408 Tel. 561-626-6017 Website? 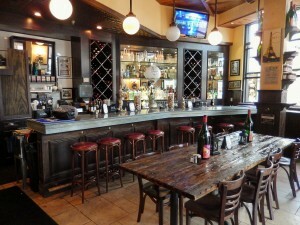 http://www.parisintowncafe.com. This is my favorite of the two. 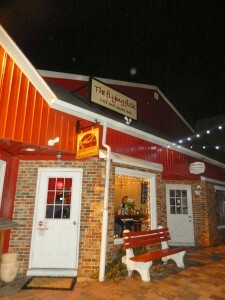 Quaint, a bistro serving, crepes, paninis, salads and pastries. They open Monday through Saturday from 7:30 a.m. until 5:00 p.m. Sunday from 7:30 a.m. until 4:00 p.m.
What brought us to this location was their Macaroons. The regular size and the minis. They are so colorful and gorgeous. Did you kow that the French Almond Macaroons are taking over the top spot as a favorite dessert….more sought after than cupcakes! 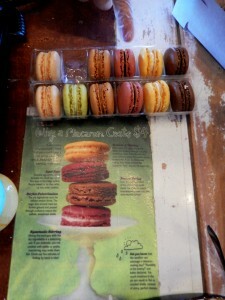 Macaroons go well with coffee, lunch, brunch, afternoon tea and even for snacks. They are more expensive due to the fact that they are labor intensive. You have to have the technique down for a macaroon to be delicious. The filling, the coloring…chocolate and fruit preserves, preferably from France add to its cost. Ground almonds are expensive and it is a key ingredient to this delicate pastry. 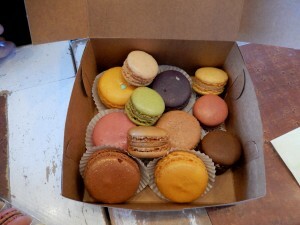 We hope the recipients of these macaroons enjoyed them…just one goes a long way. Comments Off on Paris in Town, Le Bistro, Le Cafe, Restaurant, French Bakery, The Gardens, North Palm Beach, Palm Beach County, Florida, “A Taste of France in the Palm Beaches”, Love French Macaroons! 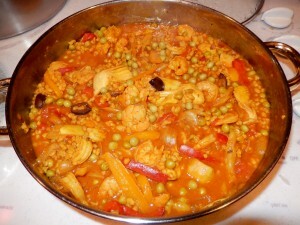 Pearl Barley Paella, Shrimp, One Pot, Easy, Nutritious, Delicious, Rehoboth Beach Eats! 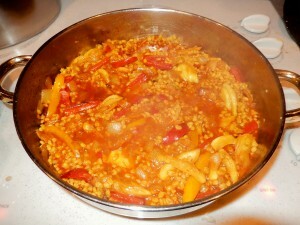 Using pearl barley instead of rice when making a paella might not be looked upon as the traditional Spanish dish. But, after having 50 pounds of pearl barley sitting in my freezer, every time I see dishes incorporating this healthy grain, I try them. It is so interesting because since we got the pearl barley many of the magazines offering new and innovative ways of cooking, barley has become center of attention. Pearl barley has a very low glycemic index, no cholesterol or salt. Paella recipes for the most part have a pinch of saffron added to the pot. Saffron is very expensive. You can use smoked paprika instead and it will be just as good. Paellas also turn to be dryer and I prefer my paella to have more broth than usual. So, needless to say that my easy one pot wonder is a tad different. I find recipes, I change them to my taste and then make them my own. This Barley Paella has medium shrimp, but feel free to make it with bite size pieces of chicken, or a combination of both. Mix the barley with water in a saucepan and bring to a boil. Cover and boil for about 2 minutes, then turn off the heat and let it sit for an hour. You want the water to be absorbed. 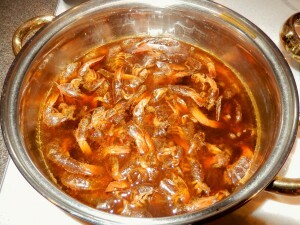 Peel the shrimp and place the shells in a saucepan with the vegetable stock. Heat and cook for about 5 minutes, turn off and let it sit. This will give added flavor to the broth. Discard shells before adding to the pot. Heat oil in a large pan over medium heat. I don’t have a paella pan so I used the largest pan I could find. 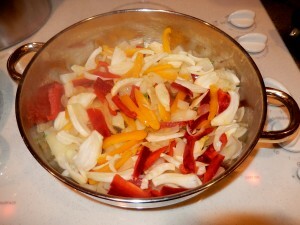 Add onions, cooking until soft, then add the peppers and fennel. Cook for about 5 minutes, then add garlic and cook for a bit longer. Add bay leaves, paprika, turmeric, and cayenne. Mix in the barley. Cook for a few minutes and add the vinegar, 2 cups of stocks and salt (optional). Bring to a simmer. Stir and cook until liquid reduces by half, about 5 minutes. Reduce heat and simmer until some of the liquid is absorbed. 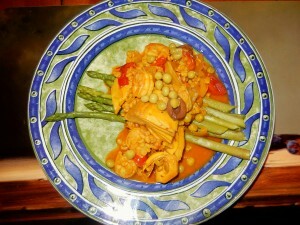 Stir in shrimp, peas, tomatoes, artichokes, olives and remaining 1/2 of stock. Simmer for a couple of minutes and then turn off the heat. Cover and let it rest 10 minutes or until shrimp are just cooked through. I served the Shrimp Pearl Barley Paella over steamed asparagus and to tell you the truth it was so good!! I also sprinkled a few peas over the dish for added color. 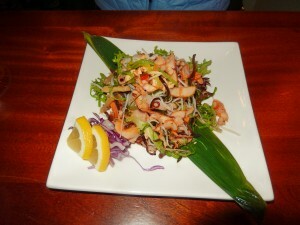 Comments Off on Pearl Barley Paella, Shrimp, One Pot, Easy, Nutritious, Delicious, Rehoboth Beach Eats! The Rehoboth Art League, RAL, Teaching, Inspiring, Preserving the Arts, Rehoboth Beach, Delaware, Southern Delaware, Events, Monthly Salons, Art of Mixology, Dogfish Head, Thursday, March 27…Entertaining, Enlightening and Captivating Evening! Not to be Missed!! 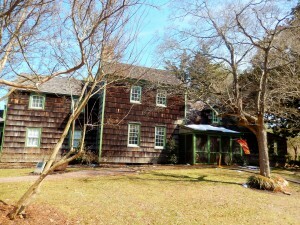 It seems so long ago when I would take my two boys for art classes and summer camps at the Rehoboth Art League (RAL). As a young mother I wanted them to be exposed to the arts. No better place to enjoy, learn and be inspired than the setting of the RAL. 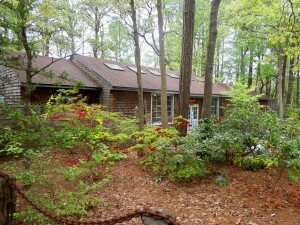 Pretty soon the azaleas will be in bloom and this historic campus will be transformed…the flowers will be incredible. The campus serves as an outdoor classroom whenever possible. 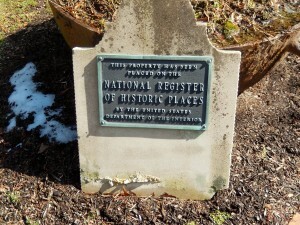 The Homestead has a historic designation. 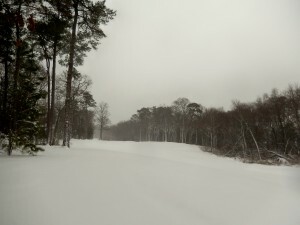 Until Sunday, March 23rd a Members Showcase: Juried Drawing. You can visit until 4 p.m. on Sunday. Also, until Sunday, March 23rd and exhibit called Young at Art. This annual exhibition is an opportunity for over 25 private and public schools in Sussex County to join together and feature the amazing artwork created by local students. You can visit the Gallery until 4 p.m. on Sunday. The RAL is celebrating and they have reason to: 75 Years!! So many events are scheduled through 2014 so be sure to check the above mentioned website, whether you live here or you are visiting. During the 17th century…it was a time when women or Salonnieres were a powerful influence in the Salon. Many ambitious women used the Salon to pursue a form of higher education. Last June and continuing through Mid 2014 the Monthly Salons began to take place. These salons are an updated take on the fashionable Salons of 17th century Paris. The Salons in Rehoboth Beach will feature a unique and vibrant art related topic followed by a discussion led by a leading professional on that particular month’s topic. After June, the Salons will take place quarterly. 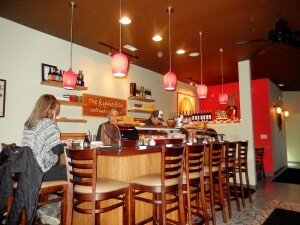 Salon #9 will take place on Thursday, March 27th at Dogfish Head located in Rehoboth Avenue. It will be upstairs. The topic will be Art of Mixology. It will start at 6 p.m. The Salonniere will be Mrs. Debra Killeen who is very excited about an evening of relaxation, learning the art of Mixology and the enjoyment of a few off centered drinks from the masters at Dogfish. The cost is $25.00. Please call 302-227-8408 for ticket information. 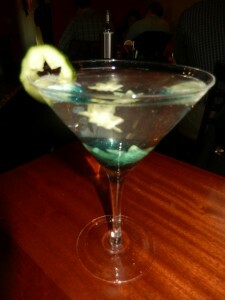 The evening will combine the art of the perfect drink. It will be entertaining, enlightening and definitely a most captivating evening!! 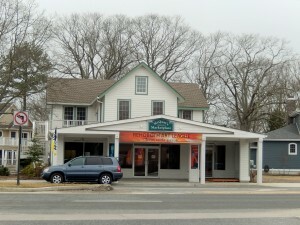 Please note that when in town, stop at the the Rehoboth Art League Annex on The Avenue located in the old McQuay’s building on Rehoboth Avenue, across from the Visitors Center. Comments Off on The Rehoboth Art League, RAL, Teaching, Inspiring, Preserving the Arts, Rehoboth Beach, Delaware, Southern Delaware, Events, Monthly Salons, Art of Mixology, Dogfish Head, Thursday, March 27…Entertaining, Enlightening and Captivating Evening! Not to be Missed!! 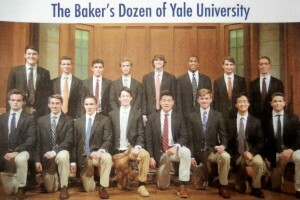 A brotherhood known as The Baker’s Dozen. It was formed in 1947 and it is considered one of the nation’s oldest and finest a cappella singing groups. The group is known for its diversity, tradition and camaraderie. Their passion for music and friendship is what has bound them since its beginning. Once again they are performing at the Delaware Beaches by popular demand. They are being hosted by Cathy Davies-Harmon and Darren Harmon. Their son, Hunter, is a member of the group. The performance will be at Cape Henlopen High School Theatre, located on Kings Highway in Lewes, Delaware. It will begin at 7:00 p.m. Gather your friends and family and attend this heartwarming concert. If you have any questions, please contact Cathy at 302-644-6606 or 302-542-6774. During their winter and spring break the Baker’s Dozen tours have taken them to Puerto Rico where they entertained orphaned schoolchildren. They have also performed for the President of the United States, school and community auditoriums and even to private Hollywood parties. Their concerts feature traditional favorites and also contemporary hits. If you would like to know more about them, please visit http://www.thebakersdozen.com. So, remember, it is Friday, March 21st at 7:00 p.m. at Cape Henlopen High School Theatre. It is getting close that time of the year where looking for a prom dress for many young women is almost like a competition. I remember my friends telling me that they had to get out of town to get a prom dress for their daughters. No way…something different is what was needed. 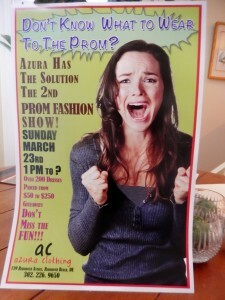 Say no more because if you do not know what to wear to the Prom, then Azura Clothing is hosting the 2nd Prom Fashion Show!!! It will be Sunday, March 23rd from 1:00 p.m. until….? The dresses will be priced from $50 to $250. There will be lots of giveaways….so, make sure you do not miss the fun!! It really will make things so easier instead of driving around all over the state. Ms. Hu’s 2011 debut CD of solo piano music by Choping won Taiwan’s 2012 Golden Melody Award for Best Classical Album of the Year. On Saturday, March 22nd, this Taiwanese pianist will be performing at the Bethel United Methodist Church Hall on Fourth & Market Streets, in Lewes, Delaware. The concert will begin at 7:00 p.m. The Philadelphia Enquirer has declared her a “first class talent” and Ms. Ching-Yun Hu is rapidly gaining worldwide recognition as an artist of shimmering technique. She is a winner of the 2009 Concert Artists Guild International Competition, and has also captured the top prize and the Audience Favorite Prize at the 12th Arthur Rubinstein International Piano Master Competition in Tel Aviv. The Jerusalem Post called her “musical, energetic and full of flair”. 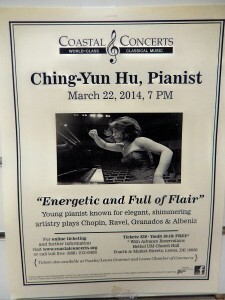 For tickets and more information, please visit http://www.coastalconcerts.org. Please visit http://www.chingyunhu.com to know more about her. Forget Spring….Give Me Summer!! 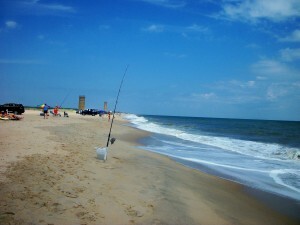 Delaware Beaches, Southern Delaware, We Are Waiting, Thursday, 4/20, First Day of Spring! Yesterday I was talking to a cousin of mine in Puerto Rico. She was complaining of how hot it was….really? The Delaware Beaches are, definitely, ready. I shouldn’t complain because it really was a pretty week-end. 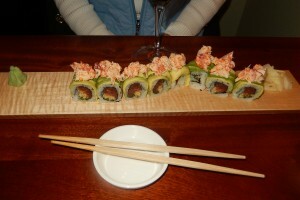 The Starboard opened its season all week-end long with revelers celebrating St. Patrick’s. Other establishments have opened, as well. When you talk to the merchants, they are not happy campers. Some say they should have closed January and February. It would not have made a difference. When Jim Cantore from the Weather Channel visits the beaches, you know that a weather event is on its way. 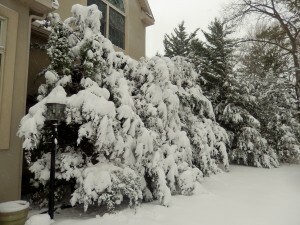 So, I am not worried because on Thursday, the first day of Spring, it is going to be 59 degrees!! 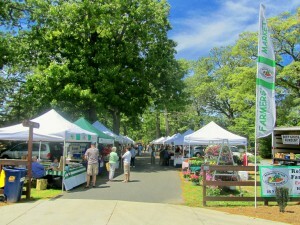 The Nation’s Summer Capital is a year-round vacation destination. But, I can’t wait for the scenery to change to the following. 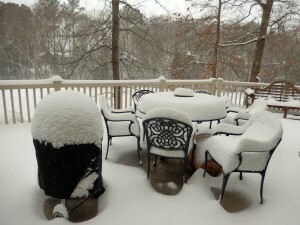 Comments Off on Forget Spring….Give Me Summer!! 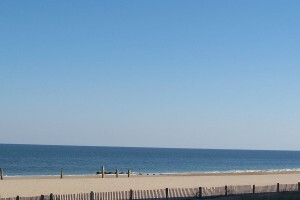 Delaware Beaches, Southern Delaware, We Are Waiting, Thursday, 4/20, First Day of Spring!